CB Insight has released its latest quarterly report on venture capitalist funding claiming new records are being spent in terms of total cash, but trends are leaning towards the bigger players. Over the course of the last 12 months, US venture capitalists spent a total of $99.5 billion funding businesses, though the number of deals stood at 5,536, the lowest since 2013. Later-stage mega-deals pushed annual funding to its highest level since 2000, though you have to wonder whether there will be any material impact on innovation, a worrying though when you consider the emerging potential of 5G for disruption. Although the majority of the segments are relatively stable, as you can see from the graph below seed-funding has been gradually eroding for some time. For those with the cash to spend, these trends make a lot of sense. Why would you take a risk on a start-up which might fail in the next couple of months when you could invest in a company which has scaled, secured customers and revenues and has a stable foundation? There are so many medium sized technology companies out there looking for financial fuel to go to the next level makes perfect sense. However, the impact on the future might be damaging for the US on the whole if it wants to maintain its position at the top of the technology rankings table. Here’s our point; not all innovation comes from start-ups or garages hidden away in suburbia, but a notable number of the significant disruptions do. If funding is being more prominently directed towards the established players, is a trick being missed? Let’s dissect that point for a second. The larger companies certainly do search for innovation, but the search is for a purpose. Nokia, for instance, wouldn’t allow their researchers to run wild without any tethers whatsoever as there are limited R&D funds available and commercial considerations have to be factored in. The search for innovation is almost certainly tied to a current commercial objective or with specific ambitions to exploit an emerging segment. This is not a bad way to do business of course. R&D has to be conducted with a purpose; these organizations have a responsibility to investors and shareholders to spend money reasonably, with the objective of making more money in the future. It certainly is sensible, but it is a restricted approach to innovation. Start-ups don’t necessarily have these burdens of responsibility, they can explore the unknown. 5G has been billed as a revolution. It will change the ways businesses operate and open a host of new connectivity possibilities to everyone in society. But like 4G, the best ideas are ones we haven’t thought of yet. They are probably businesses which do not exist. How many people would have thought of an idea such as Uber before 4G was a reality. This idea only came to be because the right conditions were in place and a creative inventor thought of it. Throughout the 4G era many of the better ideas emerged from start-ups which either scaled or were bought by one of the major players. The world of 5G is not upon us quite yet, therefore it is a bit of a pre-emptive point right now. Innovation needs to be encouraged at every level if the US is to hold off the Chinese challenge to its technology leadership position. The trends are currently leaning away from seed-funding, which is certainly sign. Technology is constantly being billed as the saviour of sluggish economies, but as the industry continues to grow Europe appears to be struggling to evolve. The claim comes in the form of Atomico’s latest report, The State of European Tech. 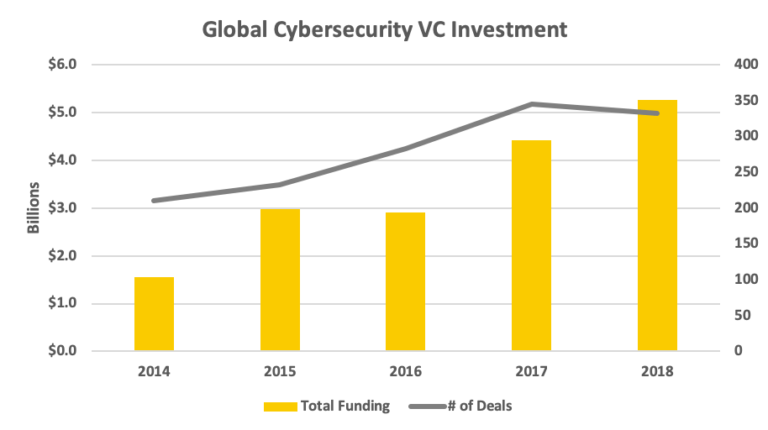 The venture capitalist firm has been producing the report for a number of years now, though with the 5G bonanza creeping closer and closer, the importance of this edition is perhaps compounded. Companies and governments need to have a technology-first mentality to realise the potential, though it appears Europe is slow off the mark. 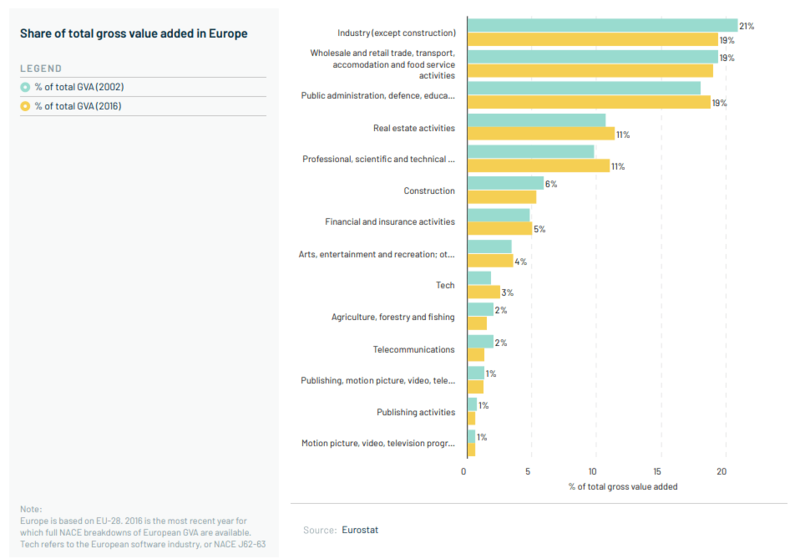 As you can see, growth in the technology industry is outpacing traditional industries, though economies on the whole around Europe are still heavily dependent on more traditional segments. This might not necessarily be the worst landscape, though as you can see from the image below, the reliance is being placed on the industries which are slumping at best, and declining at worst. Unfortunately, the telcos are some of the worst hit, owing to the disruption poured all over the industry by the OTTs in recent years. There will of course be numerous reasons for the failure to capitalise on the opportunities which are being laid out in front of us, the skills gap is one, digital divide another and perhaps government policy should shoulder some of the blame, though the situation isn’t as bad as some would think. There are shoots of potential emerging across the continent. Starting on the investment side, Atomico points to the depth of investments being made across the continent in technology businesses. So far in 2018, $23 billion has been invested in Europe’s technology ecosystem, a $5 billion boost compared to 2013. Looking at the workforce, Atomico claims there are now 5.7 million professional developers in Europe, up by 200,000 on 2017. What might surprise some is this number easily surpasses the 4.4m in the US, a number that stayed flat year on year. With the US the historical leader of the technology world, but facing a challenge from China, the workforce is certainly there for Europe to make a dent in this increasingly profitable bonanza. Both of these facts will perhaps create more opportunity than is evident on the surface. Being heavily reliant on traditional industries is not a perfect position, though should there be an ambitious attitude the burgeoning technology world can of course enhance these businesses. This does depend on what most would consider risk-adverse managers, business leaders and policy makers spreading their wings, but the potential for disruption, evolution and growth is certainly there. With US venture capitalists increasing their total investments, but reducing the number of start-ups being funded, you have to wonder whether the US is priming itself properly for the 5G bonanza of tomorrow. 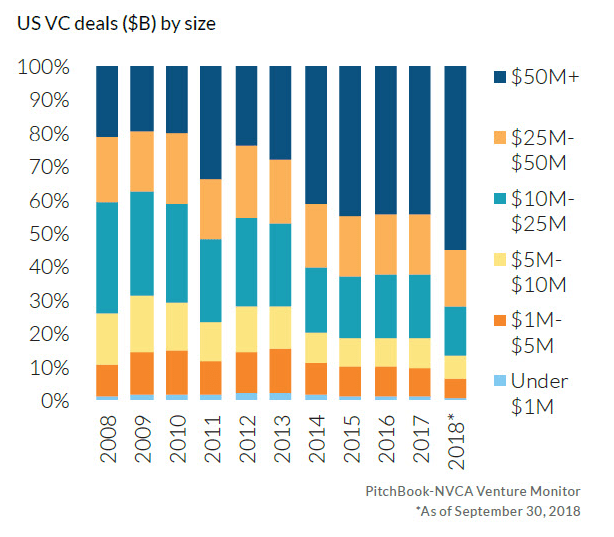 According to data from Pitchbook, the total amount invested by VCs in US firms is set to exceed $100 million across a 12 months period for the first time, but the number of completed deals is actually decreasing. 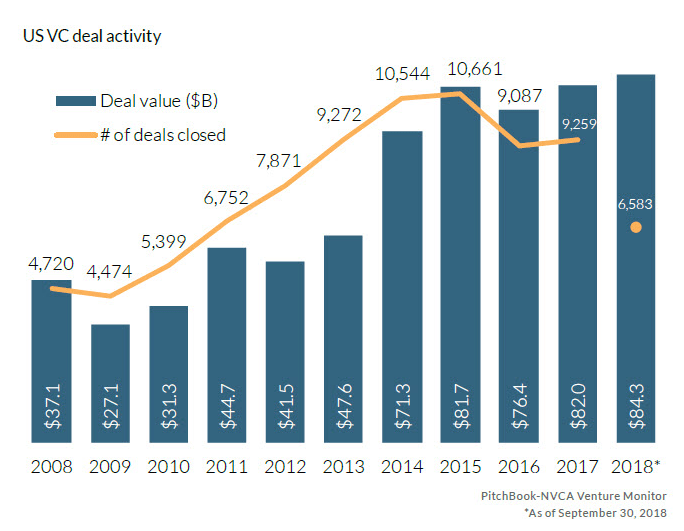 So far across 2018, VCs have invested $84.3 billion, already exceeding the total from 2017, though the number of deals has dropped to 6,583 compared to 9,259 last year. These numbers are correct to September 30, still leaving time in 2018, but you have to wonder what impact this will have on the innovators of tomorrow. Looking at the data, the number of deals which are valued at $50 million or more is significantly on the increase, while the bottom three categories (which you can see in the table below) are decreasing. This is not necessarily a bad sign, innovation can come from larger companies and more established SMEs, though some of the brightest ideas over the last two decades have come from companies which didn’t exist in the 20th century. Think of the likes of Facebook, Uber, AirBnB, Shopify, Android and Netflix, these are all organizations which have risen through the ranks in recent years and are defining their respective segments. All were powered by the democratization of the internet, in particular mobile internet, and the emergence of a new form of economics. They are companies which succeeded because they thought and operating differently from the status quo, leaving many traditional businesses playing catch-up today. In short, the start-ups are an excellent source of innovation and, in many cases, a completely under-utilised resource for national economies. However, with the upcoming 5G bonanza promising fortunes for those who seize the opportunity, is a more streamlined focus from the VCs creating the right, nurturing environment? 5G is going to create a completely different playing field, though we’re not entirely sure how at the moment. Those who think they can accurately predict where future fortunes will come from are nothing but blowing hot air. They might well be right, but this is likely more to be luck than judgment. For example, back in 2005 who would have thought a relatively unknown networking website designed for university students would become one of the most powerful companies on the planet, influencing elections, stimulating fake news and completely revolutionising how companies communicate with their customers? The point is there is a ‘build it and they will come’ attitude with 5G. If you create the right technology environments, underpin them with supportive regulations, open doors to new markets and fuel them with seeding funds, the next great idea will emerge. We don’t know what it is just yet, but that was the exciting thing about 4G and will be the exciting thing about 5G. Another consequence of a lack of available funding for the smaller players is the risk of acquisition. Without the fuel to grow their own ideas, some entrepreneurs might be tempted to sell their business and product to an established company. This in turn would direct innovation into the acquirers main focus area. Perhaps this will leave potential usecases and the dark corners of what is possible unexplored? The issue here is whether VCs are putting enough cash into the early stage start-ups to nurture this innovation and create the blockbuster idea of tomorrow. Fuelling companies which are already out there is not a bad idea, but it is likely going to get you a better version of what exists today. This is a perfectly acceptable approach to business and will reap rewards, but are these trends going to create a landscape in the US which will dominate the 5G world of tomorrow? We are sceptical.